Warbird Information Exchange • View topic - Any P-40 experts care to comment on this image? 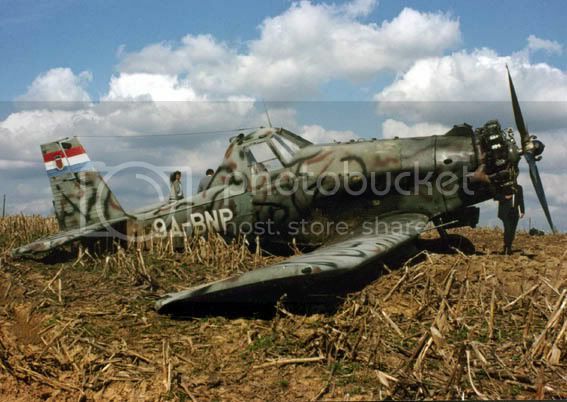 Any P-40 experts care to comment on this image? Post subject: Any P-40 experts care to comment on this image? A model, fake/photoshop or genuine? Post subject: Re: Any P-40 experts care to comment on this image? Can someone read the cameral data to know if this is scanned from an photo or are the photos from a digital camera? Apart from the fact that the front 3/4 view is poorly focussed (in what should be idea conditions) there's nothing suspicious about the images as of a real aircraft. The damage details contain numerous clues to a real aircraft belly landing that modellers seldom are able to replicate to that depth of detail. Would the canopy glass still be intact after the spinner has been ripped off and thrown behind the aircraft like that? The prop and reduction gear coming off in an accident like that isn't that unknown, and of the accident photos I can recall like that, I can't think of any where damage to the fuselage (aft of the fwd engine of course) was hit. Wing sometimes. The damaged Plexiglas in the rear quarterlight in the close up is very milky, the rest abraded as you'd expect. As you've noted the front panel is armour glass, IIRC, and tougher, but would still have abrasions. It would certainly be an interesting recover, pity the serial wasn't captured. Rich's question re- digital data would be interesting - especially if there was a geotag! The distance shots sure seem like they are too good to be true, but the close ups are mind blowing! Someone go get it! Absolutely no doubt in my mind that these are real images. The guy's friend found it on an oil expedition. If anyone can write in polish then please contact AWOT and see if we can get this thing recovered before it's trashed by scrap hunters. I'd be gutted if it went the same way as the Lady Be Good. Plenty of collectors would give their right arm for this. The plane lay so many years is not bothered by anyone. The finder of the wreck told the RAF and were able to identify aircraft. We do not know why he was only at that particular place. It may puzzle some time find a solution. Well it is interesting. No EXIF data on the image that I can find. I guess I don't know if the P-40 is real or not. IF this is real (had to get that out of the way), I wonder if we are looking at another tragic LBG story - pilot gets lost, bellies in, and tries to walk out, or he stayed there and maybe there are remains close by... I wonder how many RAF missing aircrew reports could match this? At least until we find out the serial. I think it is real. There are details that plastic and 3D modelers would miss as far as impact damage goes. The most convincing part to me, is the 3/4 front view. If you look closely into the spinner hole, you can see both banks of the Allison and the hole where the nose case was ripped out. From the details visible of structure detail it does appear to be genuine. With the rivet spacing around the Hydraulic tank access door matching others we have at hand. This may also be a RAAF 3 or 450 Sqn aircraft. Either way if genuine a fantastic find. Looking at the radio access door area just forward it looks to be a letter S visible so possibly a 260 Sqn RAF machine. Upon further review, I'm thinking the real deal as well now. Again any dates as to when photos were taken? As much as I would love to believe it, I think it is not real. You can manipulate images very easily today and this might be a real good job of a combination of images and some artistic license. Until more proof comes out, I will remain the skeptic. Looks legit to me. As a modeler, I can tell you that even the best I've seen can't replicate sheet metal damage and aged paint that realistically.